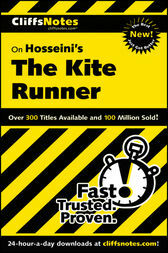 In CliffsNotes on Hosseini’s The Kite Runner, you explore life in Afghanistan and the United States, and through that the similarities as well as the differences between the two countries and the two vastly different cultures. The Kite Runner is the story of both fathers and sons and friends and brothers, and it is a novel about right and wrong and the nature of evil. This is an historical novel about the pre-Russian invasion and pre-Taliban rule of Afghanistan, as well life in Afghanistan under Taliban rule and life in a post-Taliban Afghanistan. Although the story is fictitious, the information about the political, social, and cultural systems of this Middle Eastern country provides a contrast to the contemporary headlines about Afghanistan primarily being home to terrorist cells. The Kite Runner paints a realistic portrait of a country about which most readers probably know very little and enables readers to separate the people of a country from its leaders (the Taliban) and/or groups (terrorists) associated with it.